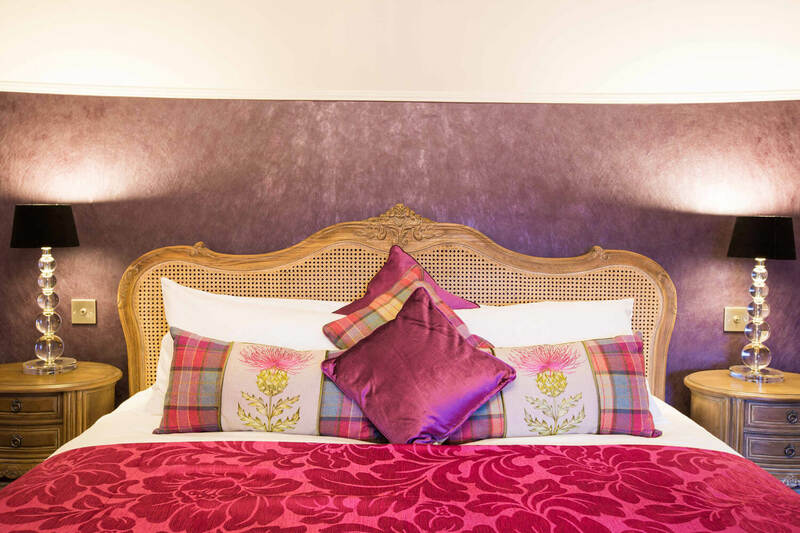 Overlooking Muckrach Castle, Speyside’s Louis xvi style furniture with fuschia pink soft fabrics and crystal chandeliers ensures that the room has feminine undertones. A fabulous sleep awaits you in the superking bed with the luxury of a Hypnos Richmond mattress (with upholstery known as the “God of sleep”), premium pillows and soft white cotton bedding. Located on the second floor by staircase. Crystal chandeliers, textured fabric wallpapers, Wilton carpet and 2 relaxing armchairs with coffee table help to create a rich and relaxing experience for your well-deserved break. Tones of fuschia pink.